After Amsterdam I made my way to Brussels. 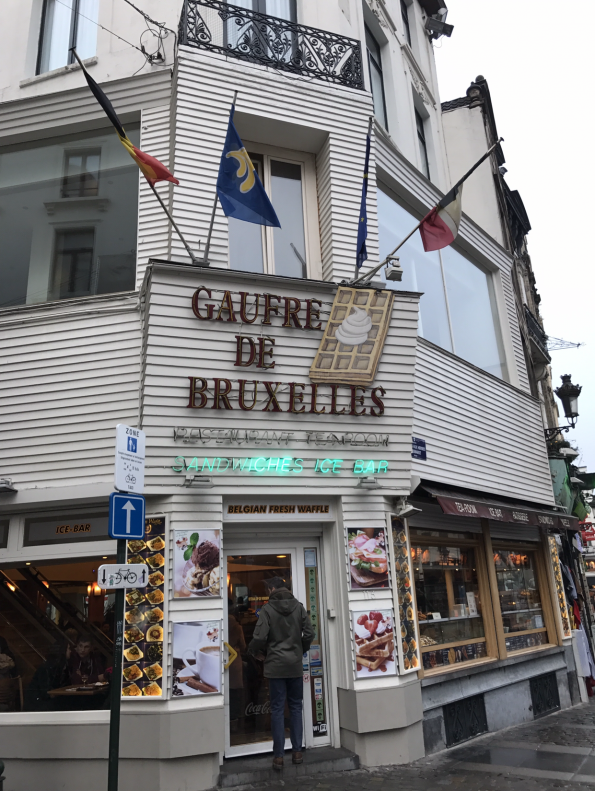 I knew I wanted to try their chocolate, waffles, and beer, but hadn’t done too much research on where I wanted to actually go and see while in Brussels. 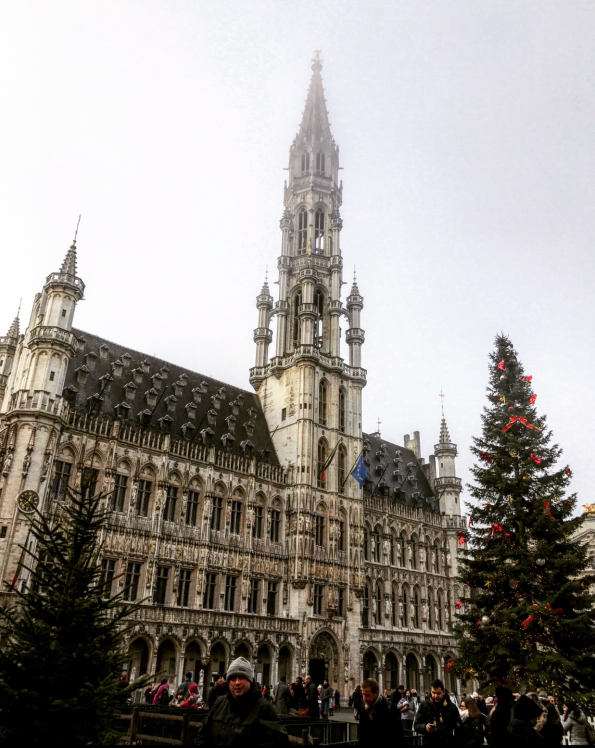 When I got there, I kept reading about The Grand Place, so I decided that’s what I wanted to do. Instead of just walking straight there I decided I would take a walk and see where I ended up. 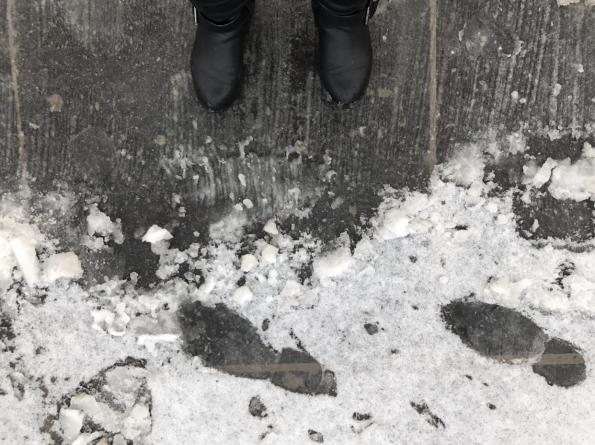 It had snowed the night that I got in, so the next morning when I was ready to leave the sidewalks were covered in ice and it was really hard to walk. My boots aren’t snow boots, and the bottom of them are completely flat so I was terrified that I would fall and hurt my knee even more (by the way, my knee is getting better and better! ),which meant I was walking maybe 10 steps/minute in certain areas. Some of the areas were easy to walk because the sidewalk had a grip to them, but there was one area near Downtown that had really sleek, almost marble like floors, a lot of stairs, and no railings to hold on to. But I got through the small area after probably 45 minutes, and survived, so I continued my journey. I ended up finding a waffle restaurant so I decided I needed to eat waffles while in Belgium and went in. Oh my gosh, it was so good; I had a waffle with bananas, whipped cream, and chocolate. After my waffles, I just kept walking to find a street with cute little shops. A lot of them were chocolate shops, so I just walked through to find some gifts for people back home. It was really overwhelming with so many chocolate shops to choose from that I just aimlessly walked in and out of each one without really buying anything. Then at one point I just turned a corner into a little alleyway, and on the other side I saw a gorgeous building with beautiful gold accents, and designs that were really intricate. I I said to myself that must be The Grand Place, and started taking pictures; I then got closer and was in the actual square when my jaw literally dropped. Like I said I hadn’t done too much research, and I didn’t really even know what The Grand Place was. It turns out it’s a square with these buildings all around that are absolutely stunning. I honestly just stood there taking it all in, and wondering how on earth something could be so pretty. 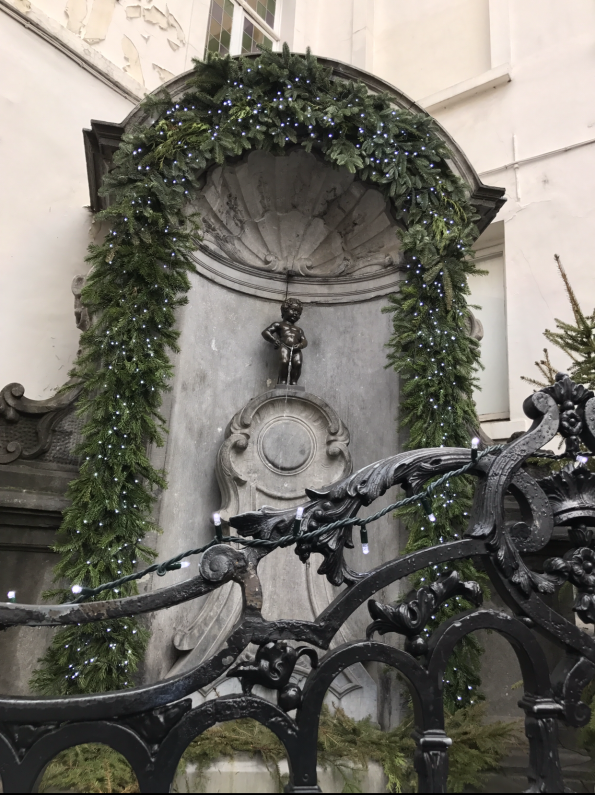 I took a lot of pictures and then went on a hunt to find Mannekin Pis, which is a statue of a little boy peeing. He is really cute, and something that everyone who visits Brussels should go see. After Mannekin Pis, I headed back to Dam Square, and then do some actual chocolate shopping! Sign up to receive notifications of new content on bonvoyagewithbri.com!